In this article we are going to learn how to find your WooCommerce customer lifetime value and how to search and filter your WooCommerce customers based on their lifetime value. The WooCommerce module of Users Insights provides a field called “Lifetime value”. 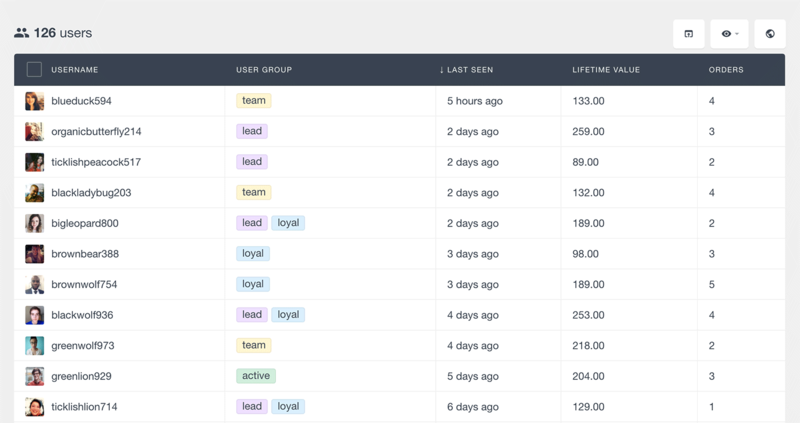 This field is available in the user table and the Users Insights smart filters. This field gives you a good estimate of the total money spent by each customer. When it comes to measuring your customer value, the lifetime value field is a little more accurate measure than the number of orders field. Although the number of orders can show you the customers with most purchases, they might not be your most valuable customers, as they might only buy the cheapest products. For example, a customer who has bought 2 products at the price of $100 is more valuable (based on the money spent) than a customer who has bought 5 products at $10. Customer lifetime value (CLV or LTV) has a few different definitions depending on the business model used and/or the level of accuracy used in the calculations. In general, lifetime value is mainly defined as the dollar value of the customer based on present total spent and future projected cash flow for the customer. When used in this manner, the lifetime value metric is mainly used as a tool for business predictive analytics and projections. The customer lifetime value that Users Insights provides is better defined as “actual lifetime value” of a customer. This means that this number shows the total amount spent by the customer so far and does not include the future projected spent. This is also sometimes defined as Historic CLV – which is a number that represents the sum of all historic purchases of a customer. 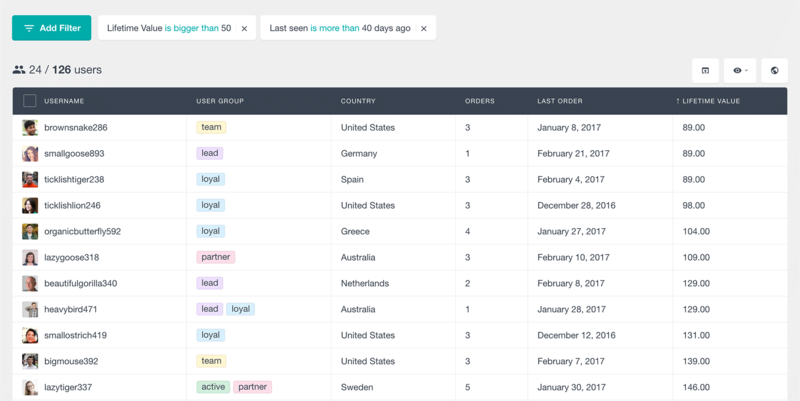 The easiest way to find your most valuable customers in Users Insights is to simply sort your customer list by the Lifetime Value field. You can do this by clicking on the title of the Lifetime Value column in the user table. If this field is not visible you can show/hide the fields from the eye icon menu. 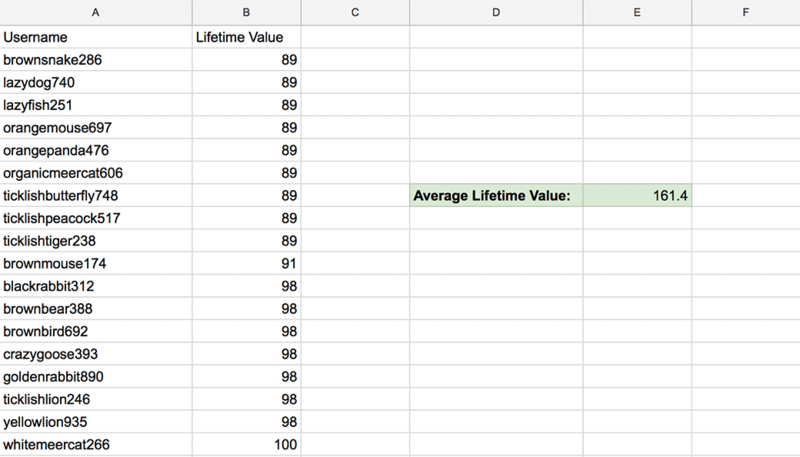 Clicking on the title of the Lifetime Value column will sort all of your customers by this field, showing you the customers with the highest lifetime value at the top of the list. If you want to order your customers list by their smallest lifetime value, just click on the lifetime value title one more time. The lifetime value field is also available in the Users Insights smart filters. If you click on the “Add Filter” button and select the Lifetime Value option from the list, you will get a list of all the available filters for this field. The first filter option is “Lifetime Value is”. As the name suggests, this filter allows you to set an exact value for the lifetime value filter so that you can show all the customers whose lifetime value is equal to the set value. The second option is “Lifetime Value is bigger than”. This option allows you to set a minimum value to the lifetime value filter. This is helpful if you want to show all the customers whose lifetime value is bigger than a certain number. An example will be all the customers whose lifetime value is greater than $100. The last option is “Lifetime Value is less than”. This allows you to set a top limit to your lifetime value filter. This filter can be useful if you want to get a list of all the customers whose lifetime value is smaller than a specific amount. For example, a list of all the customers whose lifetime value is smaller than $90. 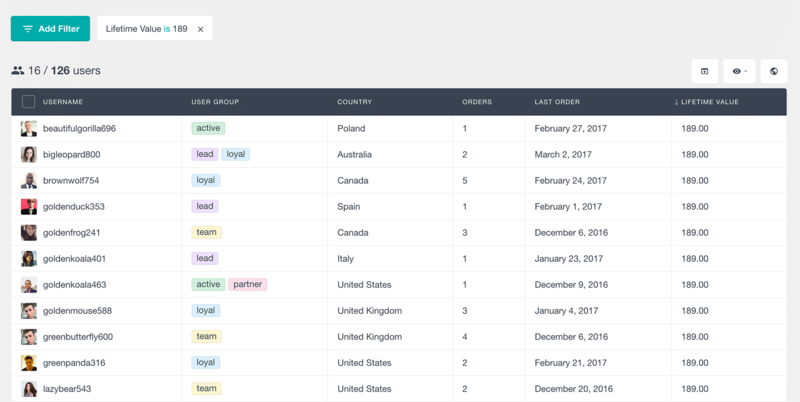 Since the Users Insights filters are stackable, it is very easy to apply multiple filters at once and get more specific segments of your WooCommerce customers. Here is an example of all the customers who have made an order in the last 30 days and have a lifetime value that is bigger than $100. 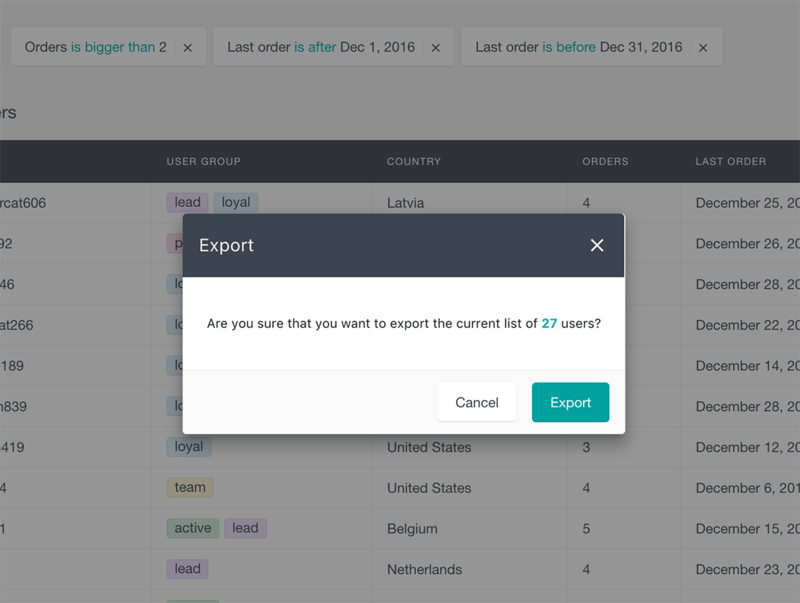 Thanks to the export feature of Users Insights you can easily export a list with all of your most valuable customers and their email addresses. You can then use this list to send a custom email campaign or to just send them an email to say thank you for being a regular customer of ours. The average lifetime value is a number that represent the average LTV of all of your customers. The simplest way to calculate the average lifetime value of your WooCommerce store is simply by dividing the sum of all of your customer lifetime values by the total number of customers. where B is the LTV column and A is the column containing the customer username. Then just press enter to apply the formula. This will show you the average LTV number for your WooCommerce store. Of course this number is not fixed for your store and it will change with time but it’s a good indicator for your overall performance. And that it’s! 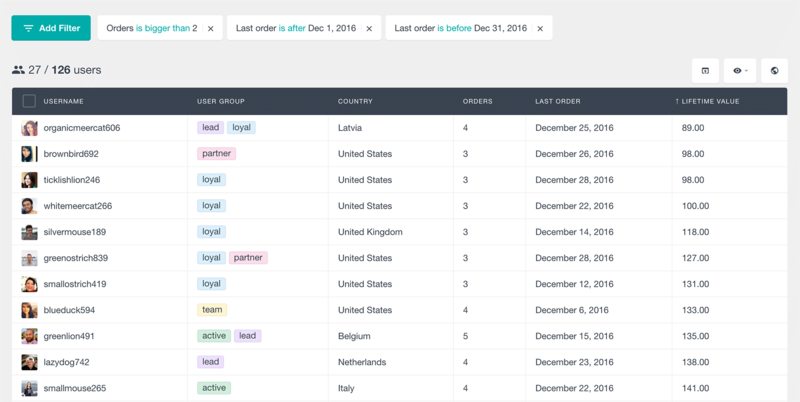 Now you know how to find your most valuable customers by using the lifetime value filters of the WooCommerce module of Users Insights. 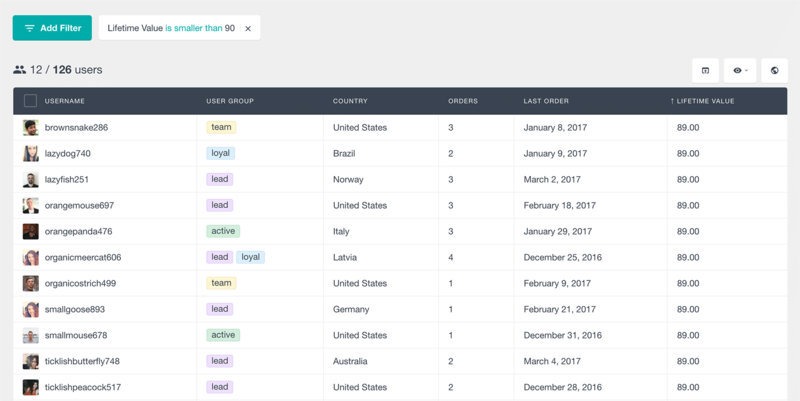 We hope that this article was useful and that you now have better tools to manage and understand your WooCommerce customers.